By Brian Voo in Mobile. Updated on November 13, 2017 . Conventional to-do list apps or programs most of the time work only on one device. If you have an Android phone and work with an iPad, you’ll have to use 2 separate apps or find a way around the OS differences. Imagine if you had 1 app that worked on all platforms, and on top of that works on your desktop browser (Google Chrome) too! Well Any.DO has created that for you, and it is free with no limitations unlike other apps which asks you to purchase the ‘pro’ app to unlock certain features. The app uses a simple and uncluttered design which makes it really attractive, supports speech detection in multiple languages, and syncs simultaneously across multiple platforms. Before we get started, download Any.DO onto your devices. 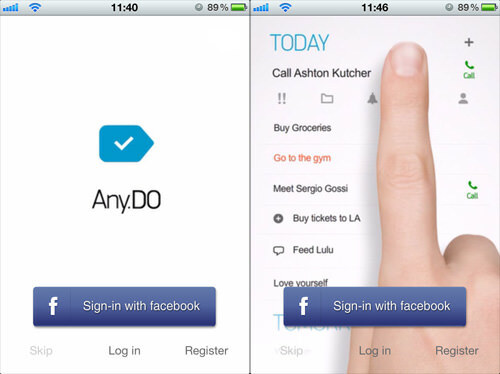 Any.DO is available on the iOS, Android and even as a Google Chrome extension. Register an account via email or Facebook login. Registration is needed if you want to sync your data across multiple devices. We’ll show you the rounds as we see it on the iPhone. Settings and features may differ on Android. 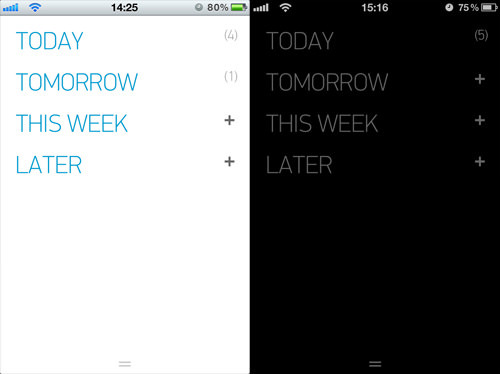 To begin adding one of your own to-do Tasks, pull down the main screen and start typing. While you type, it gives you other keywords and sometimes even ‘finishes up’ your words for you. 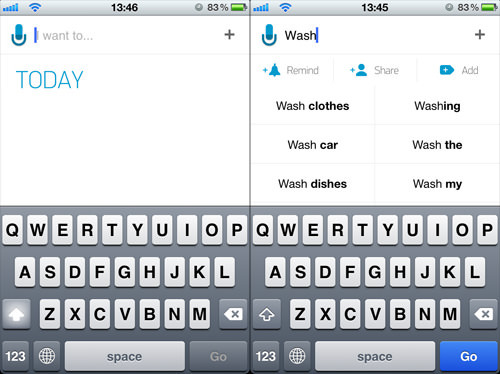 Merely Typing "Wash" shows suggestions of possible things you could wash, say, your car, the dishes or your clothes or laundry. Entries can also be added with Voice by tapping the microphone icon. Dictate your Tasks with ease as its Voice recognition works quite accurately. This is great for making notes while your hands aren’t free. To help you be more organized, Any.DO lets you organize to-do lists based on Category: ‘Personal’ or ‘Work’ and based on a (due) Date: ‘Today’, ‘Tomorrow’, ‘This Week’ or ‘Later’. 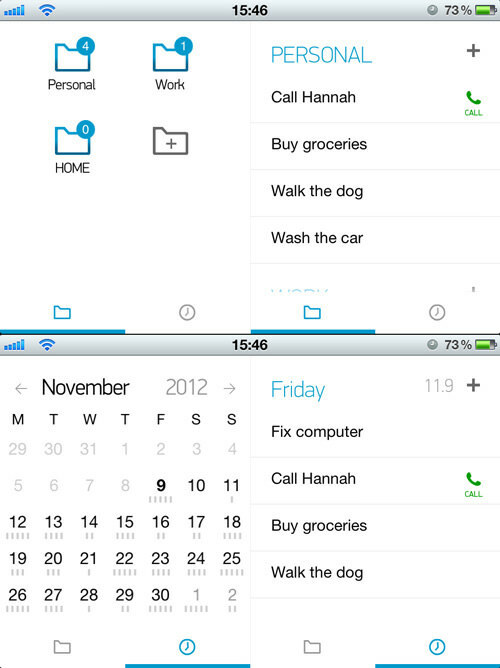 By default, new Tasks go into the Personal category (for reference purposs, on Android, they are called Folders). The categories can be expanded when you tap on them. 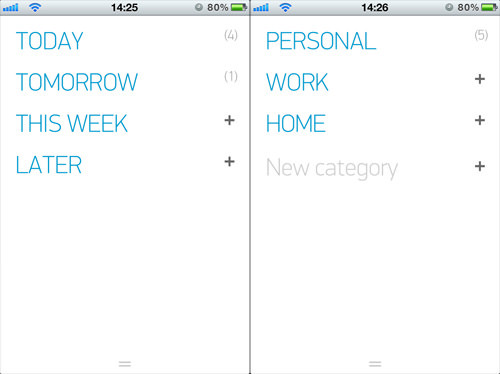 You can also rearrange the Tasks with a long press then dragging it to another category or date. To create a new category, tap on New category to add a new folder. On Android, creating a new Folder is accessible via Settings > Folders. If your Task happens to have the words ‘Call’, ‘Email’ or ‘Text’ together with a name of someone on your contact list, you will see icons pop up next to each Task. 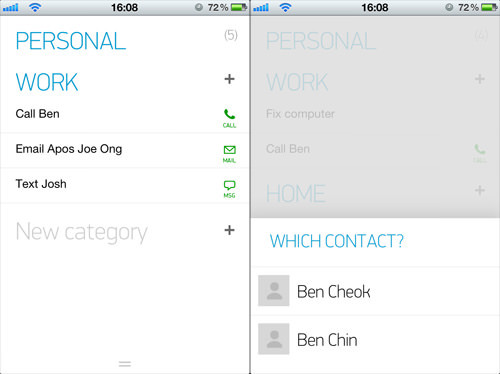 The icons for Call, Mail and Message will give you quick access to your Contact List based on how you want to contact the person. 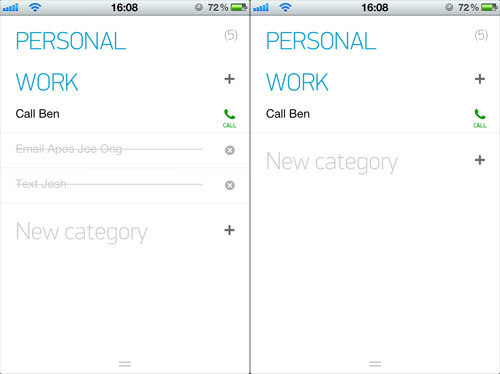 Tapping the icons allow you to call the person immediately, write up an email, or a message to send. If you have more than one contact with the same name, it will give you an option to choose the which contact you want to interact with. To remove an already completed task, all you have to do is swipe the task from left to right, undo this by swiping from right to left. To remove completed tasks, tap the circular X button or shake your device to remove all completed Tasks in one go. You can view every removed task by tapping on ‘Done’ located in the ‘Settings’ menu. 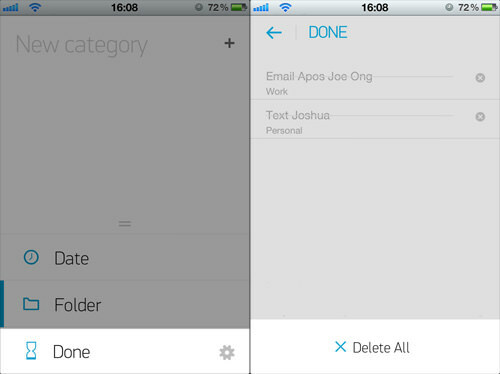 From there, you can completely remove past completed tasks or restore them by swiping from right to left. To-do apps are pointless without reminders. 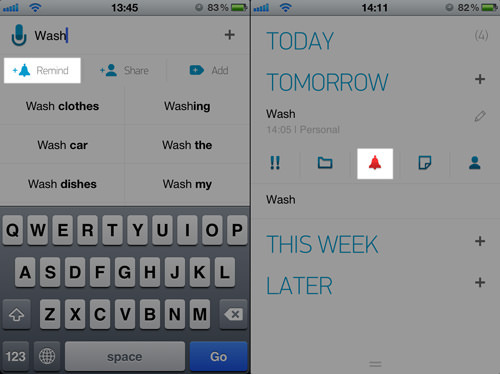 On Any.Do, you can add reminders by tapping the Remind button or Bell icon when creating a task. When setting the alarm for your to-do item, you can change the time and/or date (if needed), and set when it should notify you. You can be notified on the time set, or 5, 10, 30 minutes or 60 minutes prior to the set time. 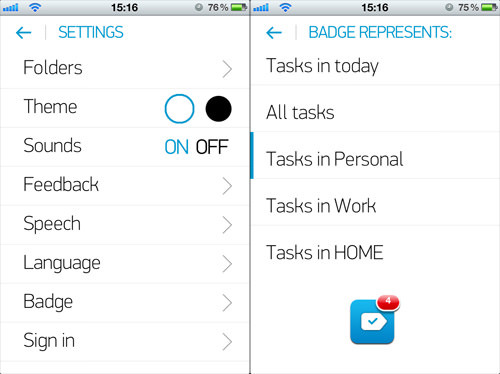 Under ‘Badge’ in ‘Settings’, you can change the app badge settings to make it easier for you to determine the number of tasks you have to do, and customize it to show tasks in individual categories as well. 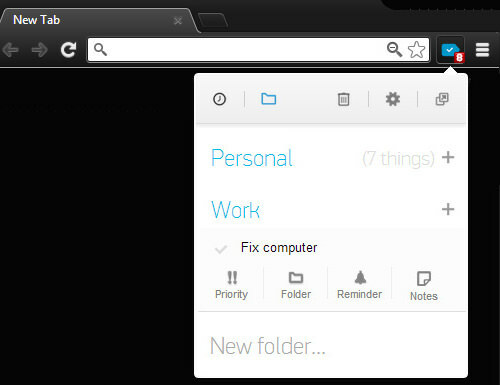 In landscape mode, you can view all your categories and tasks on the same page. You can then drag-and-drop Tasks from one Category to another, or change its due date. You can even access your iPhone calendar to check what other events are happening on those dates. Syncing plays an important part for Any.DO as because users like you and want access to our to-do lists no matter which device we are on. Registering for an account allows you to sync your Tasks on any device you own but with the Google Chrome extension, they have taken things up a notch. The interface looks pretty much like smartphone app with all them bells and whistles attached. When you are done with a task, just click on the Tick symbol to the left of the Task to clear it. As the Google Chome extension also comes with Gmail integration, you get a great Remind Me button that helps you ‘clip’ emails you are working on and put it in your to-do list. The task will appear on your list with a direct link to the email in your mailbox for fast access, great for those who work extensively with email. The great minds behind Any.Do have pretty much thought of everything, including providing a light and night theme background. All in all, Any.DO makes for a great app with a simple design; with its capabilities to sync on the iOS, Android and even Google Chome, you’ll be sure to never miss an important task ever again.